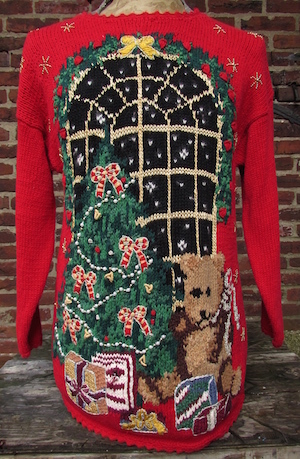 (mens L) Night sky, Xmas Tree, Snuggly teddy bear Pullover Sweater! Home > Ugly Christmas Sweaters > mens MED Ugly Christmas Sweaters > (mens L) Night sky, Xmas Tree, Snuggly teddy bear Pullover Sweater! Thick and warm vintage ugly Christmas pullover sweater. Deep red background with a knit design of a snuggly teddy bear waiting by the decorated Xmas tree! The tree is hung with pearl & gold beads, red/yellow bows, and surrounded by gold bead snowflakes. Quite the Ugly awesome Christmas catch! Tag reads Bonnie and Bill, ramie/cotton. Condition: Very Good: Has some color bleed. One pink stain on the window in the center of the sweater and on the present under the tree..Does not detract from the awesomeness of this sweater!